Snag a Cookie Bag to Proudly Package your Goodies. Congratulations, cookier, you've found cookie bags that are priced nice, look good, and keep the moisture of your treat inside of your cookie bag where it belongs! Cookie sleeves render your glorious confections portable and neat. Yes, we are box makers but we have within our ranks, bag makers as well. Although we do not make these bags within the walls of BRP, we know quality paper cookie bags when we see them and like your cookies, we feel these individual cookie bags hit the spot. Of course, these bags for cookies are handsome and versatile enough to be filled with other pleasing pastries and treats. 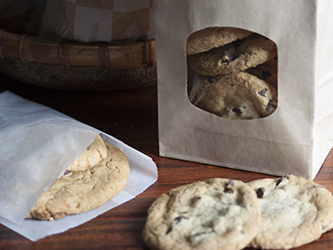 Bags for cookies are here as a part of our expanding line of cookie packaging. Jump to our Cookie Boxes page if you're looking for a cookie packaging solution that is more...square. This grease resistant little glassine bag is perfect for toting several of your tinier cookie temptations. An easy to hold cookie cargo pocket, this glassine cookie bag renders your yummies good to go. Keep the moisture of your mouthwatering snacks inside this sharp looking white bag where it belongs. The wax-infused paper of this goody bag keeps moist snacks tidy, purposefully packaged, and portable. A grease resistant cookie compartment equals packaging perfection for your on-the-go treats. This bigger little bag is a classic choice from our modest line of cookie bags ready for your morsels. Deploy this snack packaging to make your cookies and pastries portable while wax keeps hands clean. Perfect for pastries, this kraft colored cookie bag makes for an understated suave sleeve for cookies. Give your goodies some old world ambiance with this grease resistant pastry bag with classic print.